단정한 비례의 팔각연적으로 윗면은 편평하며 가장자리에서 8각 형태의 단을 이루었다. 그리고 밑면의 각 모서리에는 작은 굽다리를 8개 세웠다. 윗면의 중앙부에 물구멍을 뚫고 옆면의 한 모서리에는 주구(注口)를 붙였다. 윗면에 청화와 철화기법을 사용하여 나비를 그렸으며 옆면에도 청화와 철화기법을 번갈아 가며 사용하여 칠언절구(七言絶句)를 써 넣었다. 유색은 엷은 청색을 띠는 맑은 투명유로서 광택은 은은하고 빙렬이 없다. 청화·철화문양의 필치가 뛰어나고 칠언절구의 시가 연적의 문양, 형태와 함께 잘 어우러져서 18세기 선비문화의 일단을 보여주는 수작이라 할 수 있다. This white porcelain water dropper has an octagonal shape with a flat top surface and eight straight, perfectly-proportioned sides. At the bottom of the eight corners are eight small feet that support the body. There is a hole at the center of its upper surface through which water is poured, and a spout attached to one of the edges. 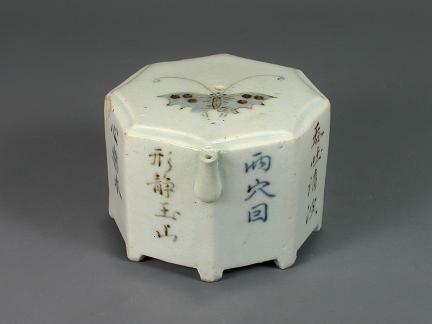 A butterfly motif is painted on the top surface in cobalt blue and iron underglaze, while a quatrain with seven Chinese characters for each line is painted on the eight sides in alternating cobalt blue and iron underglaze. The surface is coated with a clear, pale blue glaze with a subtle luster, and there are no visible crackles. This water dropper, with its exquisitely rendered designs in cobalt blue and iron underglaze and intricate brushwork, is an exceptional work of art that exhibits a harmonious beauty in its shape, decorative motif and poem, as well as providing a glimpse into scholarly life of the 18th century.